The date has been postponed to Sunday, 10th August 2008 because on the 3rd August there is a big event (?????). The closing date has been move to 31st July 2008. 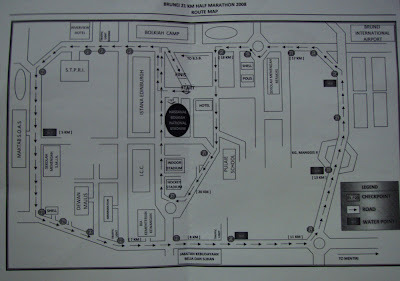 Above is the map for the 21Km run. It has a few long hills especially the Bukit Supa Save at Jalan Kebangsaan and Bukit MOF. I guess most of you don't know that the top 4 Brunei male runners for these competition will be selected to represent SCB GROE 2008/2009 (Standard Chartered Bank Greatest Race on Earth) race on four different countries. Last year only around 25 runners showed up for the selection including me. I guess most probably it will be the same runners. 10th August - I still have time to practice. Hopefully I can improve my 21k time. When is Brunei Triathlon? No announcement has been made. I hoped they do it in November or December. Closing date is 31st August. The run is on the 10th August... You must mean 31st July? last year was mainly for selection so that why not many runners signed up.